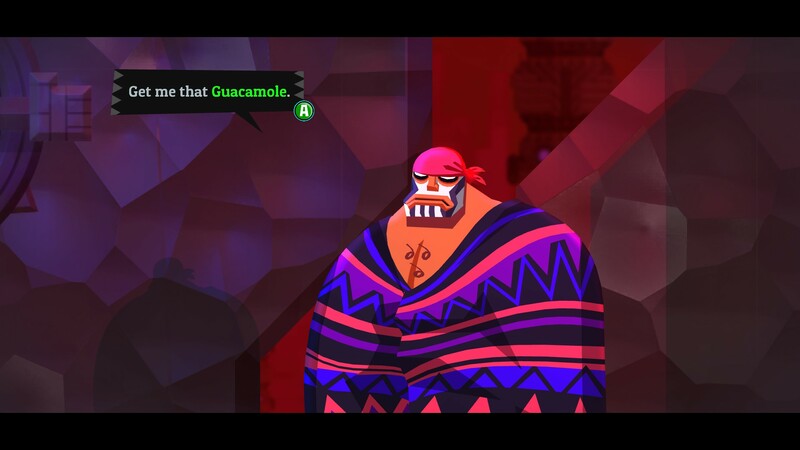 The sequel to Mexicana-meets-Metroidvania game Guacamelee has the same slick art, bonkers brawling and deadpan silliness of its predecessor. But despite its many charms and visual prowess, Guacamelee! 2 drags due to its length and over-wrought meta-references.I loved the first Guacamelee for the way it combined frenetic jumping and brawling with sugar-soaked psychedelia and self-deprecating silliness. Guacamelee! 2 contains many of the same elements, including skeletons in sombreros, lush dioramas inspired by Mexican mythology, and plenty of terrible puns. Guacamelee! 2 takes place seven years after the events of the first game. You again control luchador Juan, but now you have a wife, kids and the sleepy grimace that has plagued fathers since time immemorial. You also no longer have your cosmic luchador powers, but after a sudden crisis, set off on a journey to reclaim them and collect the three mystical relics that will save the universe. This involves travelling between the worlds of the living and the dead, as well as parallel universes and timelines. 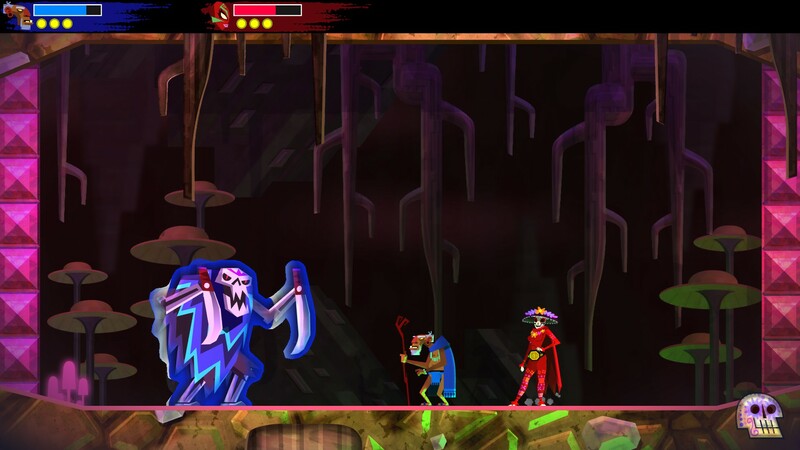 More beautiful than its predecessor, Guacamelee! 2’s visual style combines the fluidity of a Disney film with the angular outlines of a ’90s Batman cartoon. Meanwhile, the soundtrack blends arcade synths with the victorious overtones of a mariachi band. It swells along with you as Juan glides and wheels through dimensions. There’s an overworld to explore, full of eccentric characters, plus a series of dungeons that each culminate in a boss. Each dungeon involves reclaiming a fighting combo from the previous game, such as the uppercut, which lets you jump higher. Or the dash punch, which sees you advancing forward mid-air to land on hard-to-reach platforms. The fighting is fantastic for the most part – fast-paced, fluid and mesmerizingly colourful. The new move learnt also proves key to trouncing the platformer aspects of a dungeon, and is instrumental to winning the battle with the area’s Big Bad. It’s a familiar structure, but it works. As new dungeons are unlocked, you can fast travel to them via gloomy talking monoliths scattered throughout the game world. This also allows you to transit back to old dungeons with your new moves, and unlock previously inaccessible areas and bounties that you couldn’t the first time through. There’s tons of bonus content in each area, plus swathes of surreal little stories involving haunted acoustic guitars and the like, which can be picked up in the overworld. Additionally, Juan can hone his skills over at the Mexiverse’s many Fight-o-toriums, where flame-headed warriors and pugnacious roosters train you in the art of cosmic wrestling. You learn these moves at actual gymnasiums located in the game’s numerous overworld villages, places where you’ll also find the same kind of wise-cracking towns-folk and curious side-quests as in the first game (trip to the Piñata factory anyone?). Each school of wrestling has distinct advantages that lend flavour to your play-style. They’re also entirely optional to take-up (although you’ll struggle to find a use for all those shiny coins otherwise). Favouring raw carnage, I opted for a ton of Flame Face’s fighting moves, such as a furious pile-driver. Guacamelee! 2 ups the ante with new trans-dimensional hopping puzzles that are crucial to progress. Rifts between reality appear, offering access to an alternate dimension coloured in contrasting hues. You can flip between the two worlds, causing some platforms to appear or disappear and nasties that materialise as shadows in one dimension emerge fully rendered in the other. Sometimes the realities shift throughout dungeons, moving onward in a steady kaleidoscopic march. You must time your moves along with the shifts to stay alive. I found the trans-dimensional hopping puzzles led to scream-worthy levels of frustration at times. They’re hard. You’re juggling the madcap jump and wrestling move combos, while the entire world literally shifts around you. Razor vines, angry skulls hurling swords at you and pools of unknown liquid that spell instant death all manifest as if at random. It’s a juggling act to beat them at times and faltering for even a millisecond usually spell’s instant death or a restart. However, these challenges can be hypnotic in the way beat-matching games like Guitar Hero and Audiosurf are. Some are gratifying to complete, especially when you hit your stride and get into their tight rhythm. The game is at least forgiving. Death sends you back to the start of scenes and key puzzle points, so it’s easy to keep up the breakneck pace no matter how many times you get zapped by deadly lights or evil skull clowns. 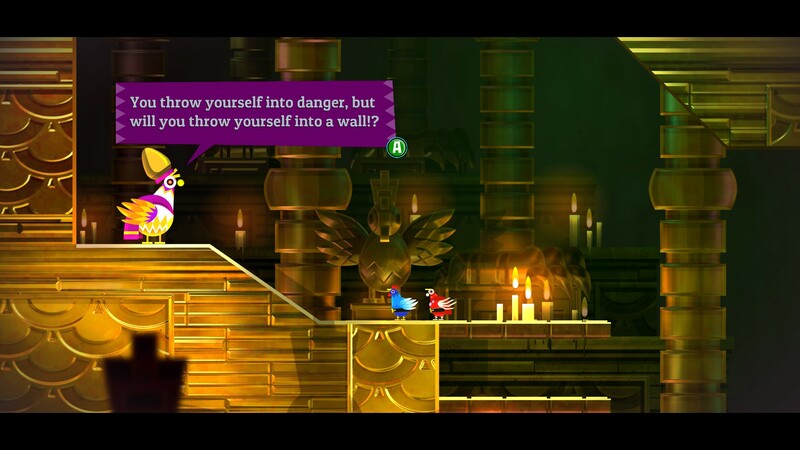 The game also goes further in another area: where Guacamelee allowed you to adopt a chicken form to squeeze through hard to reach areas, the sequel cracks opens a whole new world of fowl antics and grants you strange chickeny powers. Enter, the game’s B-plot: the long-forgotten Chicken Illuminati. One of these skills is called ‘Pollo Shot’, and allows you to bounce off light-up walls at blistering speed like a jacked-up pinball. Also, nothing beats watching a tiny chicken execute a well-laid suplex on a enormous skeleton. The four-player co-op feature lends itself well to chicken-based carnage. Otherwise, I found Guacamelee! 2 too complex for a new player to join in off-the-cuff, especially at its later levels. Co-op works like this: the first player is effectively established as the lead. If they move ahead onto a new screen within the level, other characters are automatically turned into balls of light which teleport to the first player’s location. Death for any character takes them out of game for around ten seconds, after which they are restored as the aforementioned light ball. They can resurrect themselves by pressing the action button when near any other living player. This means weaker players don’t delay progress too much, although with so much going on the screen – lights, enemies, different dimensions – playing en-masse proved bewildering at times. For all its pretty art design, it’s also a shame that many of the game’s areas, despite often being in different worlds, look mostly similar. Your first jaunt down to Hell — complete with tiny clipboard wielding devils — doesn’t seem far off from the other environments. And while enemies get bigger and nastier as things progress, they are not always unique to their hunting grounds. Dungeons begin to really drag toward the end-game, merging into one endless stretch with the same beasts and different mechanical conceits. That said, there’s no lack of fun critters to pummel. They range from sentient cacti to sorcerous crocodiles and skeletons hurling flaming hula-hoops. Unfortunately the game world is littered with a similar range of meta-references, extending from Dark Souls to Limbo. These often exude smugness of the sort observed in self-congratulatory nerd-culture-extravaganzas like Ready Player One, and they descend into arduous sequences that culminate in little beyond one-note jokes. A particular extended segment pokes fun at the tedium of JRPG-style turn-based fighting, but is in itself a banal sequence that feels off-kilter. 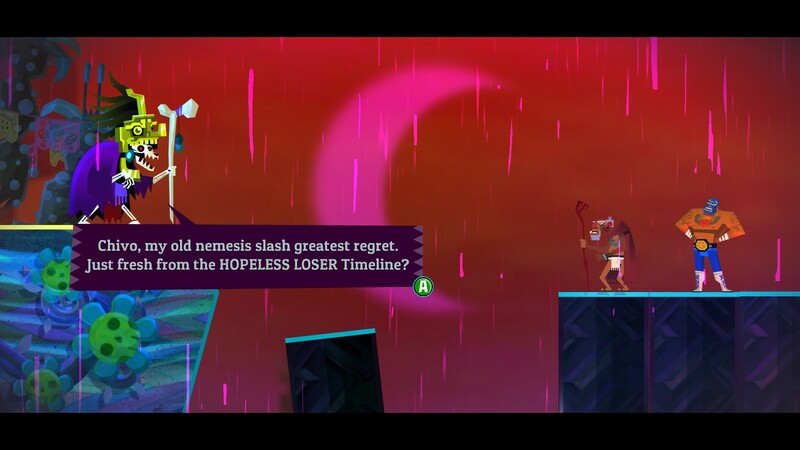 The second half of Guacamelee! 2 sees a real plateau in the learning curve of the game. Despite having an array of super-moves, you find yourself trapped in meta-jokes that serve no purpose, and dungeons that seem to have no end. It peters out, is what I’m saying. The game over-reaches in pursuit of substance, when instead it works best relishing shameless fun and hijinks. 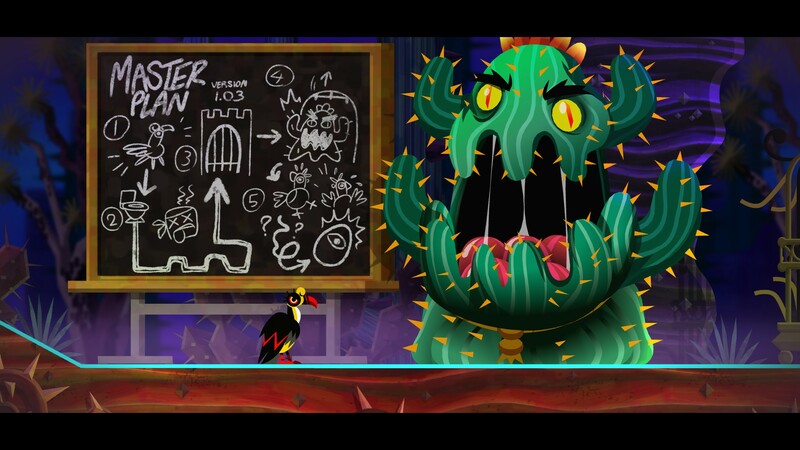 The gorgeous Mexiverse and hotheaded combat and puzzles are entertaining, but overall Guacamelee! 2 lacks the tightness that made its predecessor such a hoot from start to finish. A criticism levelled at the first game was that it was too short, but on the evidence offered here I think the series is better off lean and speedy. There isn’t enough substance to keep you wholeheartedly engaged otherwise. Tagged with DrinkBox Studios, feature, review, wot i think, Guacamelee! 2. Writer based in Brighton. Roller of cursed dice, cat wrangling extraordinaire and slave to rock and/or roll.